For service providers, deploying the 'right cloud solution' equates to high growth. With cloud offerings, one size does not fit all. The best approach requires a powerful platform with best-in-class cloud services. Basic storage-and-sync solutions offered by many OTTs and white-label cloud providers are no longer sufficient to fulfill the ever-growing demands of modern operators and users. 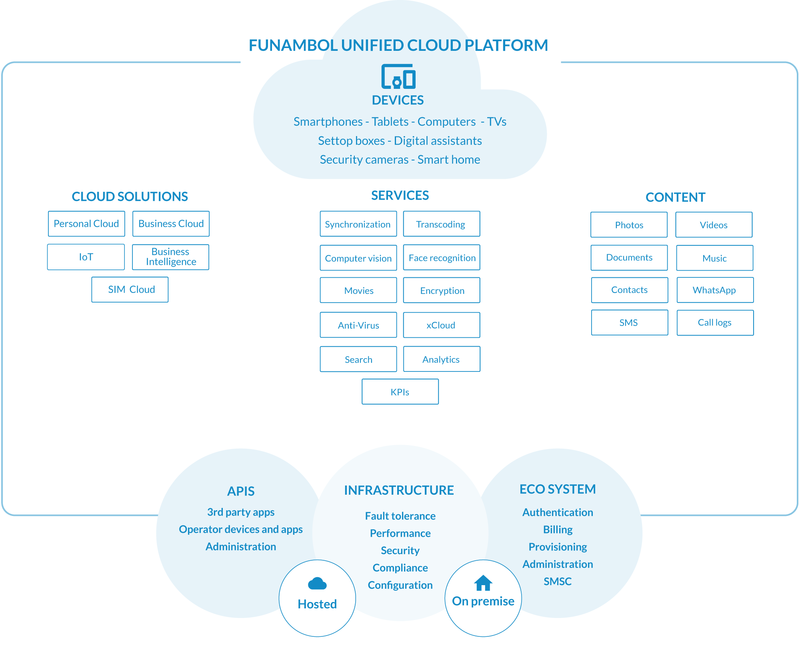 Funambol's Unified Cloud Platform uniquely enables providers to unite their multiple services and apps and leap beyond just storage with white-label solutions that deliver new and innovative ways for users to consume and share their digital content from any device ranging from smartphones to computers to digital assistants to TVs. Funambol's Unified Cloud Platform enables providers to go to market quickly with white-label solutions for personal cloud, business cloud, SIM cloud, IoT, and Business Intelligence. The platform blends support for many types of content such as photos, documents, music, contacts, and much more with advanced services such as face recognition, computer vision, encryption, montages, and xCloud to deliver a superior user experience across a wide range of devices and touch points. The platform has been designed to fit perfectly into the provider's ecosystem including branding, authentication, provisioning, billing, analytics, administration, and more. The complete set of REST APIs provides full access to the platform's functionalities for third parties as well as for deep integrations with provider-specific devices, apps or services. Funambol Unified Cloud Platform's architecture ensures reliability, performance and security for all solutions while providing the flexibility to deploy in hosted or on-premise configurations.